Best Yoga Strap Reviews in 2019 – What to Know Before You Buy? Yoga is a popular practice for people who want to keep physically and mentally fit. Some of its multiple benefits include reduced stress, enhanced flexibility and strength, and perfect posture. However, if you are a passionate Yoga practitioner, you would agree with me that the practice is not complete without the best yoga straps. What is a Yoga Strap? A yoga strap helps you assume and maintain yoga poses that might be impossible. For instance, the strap is helpful in bound poses where one hand cannot meet the other or when you cannot stretch hands to touch your toes in a seated forward fold. The straps are constructed from nonelastic or elastic fabrics like nylon, and they are available in many colors. Clever yoga mat strap sling is available in 10 color choices. Some of the colors include lemon yellow, red, lilac, rose pink, black, blue, gray, light blue, lime green and purple. This color variation lets choose a strap whose color pleases you. It is constructed from 100 percent cotton, a durable and fully washable material. Depending on your choice, you can use this yoga strap as mat carrier or for performing yoga poses and stretches. It measures 1.5-inch wide and 66 or 85 inches long. The wide width is an excellent feature as it sits comfortably on your hands, legs, shoulders, or any other contact area while using it. The Clever yoga sling has a lifetime guarantee. As such, the manufacturer will replace your strap in case it does not live up to your expectations. You can adjust its loops to fit extra thin or extra thick mats. Its price and simple design make it suitable yoga strap for beginners. The strap is reasonably priced when compared to its other competitors reviewed below. This yoga strap may not be a good option for tall people. Made in United States, this strap is arguably the best one made of nylon, a sturdy and stretchy material that can withstand wear and tear resulting from regular use. The stretchy durable fabric makes it a great fit for yoga practitioners, dancers, athletes, or for people undergoing physical therapy. The strap measures 6.4 feet long and 1 inch wide. 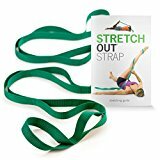 The original stretch out strap comes with an exercise book with step by step guides to more than 30 stretching exercises. The exercise guide contains colored illustrations and easy to read guidelines. This strap has ten individual loops that provide enhanced control during deep and gradual muscle stretching. It is one of the most recommended stretches out strap by athletic trainers and physical therapists. Its 6.4 feet length makes it a good choice for tall and short yoga practitioners. It is quite pricey when compared to Clever yoga mat strap sling. It is only available in the green color. Therefore, this denies you the freedom to buy a strap with your favorite color. Some users complain that the stitches that hold the loops are not reliable. Hugger Mugger, 6-foot strap, is designed from top grade cotton with string cotton webbing and a rating of 500 pounds tensile strength. This sturdy design and reasonable length make it an excellent option for tall and cumbersome weight yogis. To add to the bargain, this yoga strap comes in purple, navy, natural, and multi colors. The color difference lets you buy a yoga strap whose color pleases you. Hugger Mugger 6 foot yoga strap makes it a good option for yogis with a small or large frame. Its lifetime warranty lets you get a free replacement just in case the strap does not work as marketed. The yoga strap features easy to adjust and thread metal D ring or a plastic cinch for secure closure. Its 1.5 width sits comfortably on the point of contact. It is quite expensive as compared to OPTP original stretch out strap. The plastic cinch buckle breaks quickly. Some users complain that the yoga strip feels bulky. The natural colored yoga strap gets stained easily. 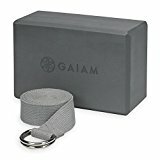 Different from other Yoga straps reviewed above, Gaiam yoga strap comes with a bonus lightweight foam block that supports your weight when making deeper stretches. The block also lets you hold your pose for long. On the other hand, the 6-foot yoga strap is made from cotton, a durable material that can withstand regular use. The yoga strap features a metal D ring that provides a secure fit. The foam block’s beveled edge provides you with a firm grip. Gaiam’s foam block is light in weight. Both the strap and the block are easily cleanable using a mild detergent. The combo is available in grey and purple colors. Its 1.5-inch width sits comfortably on the point of contact. It is more affordable than Hugger Mugger 6 foot yoga strap, and OPTP stretch out strap. It could have been better if it came in longer than 6 feet styles. It is not the cheapest yoga strap in the market. Are you looking for a longer yoga strap? If yes, Hugger Mugger’s 10-feet yoga strap might be an excellent option. Like its sibling competitor above, Hugger Mugger 10-feet yoga strap is designed from 100 percent cotton, durable material. The cotton fabric also utilizes the webbing technology that gives it a tensile strength of 500 pounds. This yoga strap comes in purple, navy, natural, and multi colors to let you purchase a yoga strap whose color pleases you. Its length and 500-pound rating make it an excellent option for tall and heavy yogis. The yoga strap’s features metal D ring or a plastic cinch which is easy to adjust and thread to a secure closure. It is the most expensive yoga strap in our bets list. The yoga strap may not be an option for small framed yogis since it feels bulky. Some users argue that plastic cinch buckle breaks easily. The natural colored yoga strap required regular cleaning to prevent it from staining. Based on the yoga strap reviews above, the market offers multiple yoga straps that differ depending on price, construction material, and length. While this presents you with a wide range to choose from, it makes it hard to choose the best one from the variety. If you are in this situation, the follow our expert guides & considerations below will help you make an enlightened decision. Size is the first consideration to take into account. In the real sense, a 6 feet long and 1.5 inch wide is the universal size. However, if you are tall, you will want to shop around for one that is 8 or 10 feet long. The conventional types of closures used in yoga straps are cinch buckles and D rings, and some yoga straps lack a closure. D rings and cinch buckles are easy to use, and they give a secure fit. However, you should be wary of cinch buckles and D rings that are made of cheap plastic or metal. A yoga strap without a closure gives you the freedom gives you the freedom to use your strap as you wish. Most yoga straps are designed from cotton, a durable, breathable, and fully washable fabric. Some straps are also designed from a nylon that is stretchy, water resistant, and more durable than cotton. As such, the choice of material depends on your preference. Some yoga straps come in different colors to let you pick your favorite color. Since different yoga straps are sold at varying prices, you should take your time to shop around for a strap that falls within your budget. In the bottom line, you should opt for yoga straps with a generous warranty as it protects you against defects. The best yoga strap is essential for any yoga students. This is because the straps help the yogi to maintain proper alignment when doing various stretches, and it provides additional length to achieve bound posses. Good yoga straps are designed from a durable fabric, a sturdy closure, and they have a reasonable warranty. If you are looking for a strap with those qualities, we suggest that you try any of the yoga straps reviewed above as they have all hallmarks that define a good product.